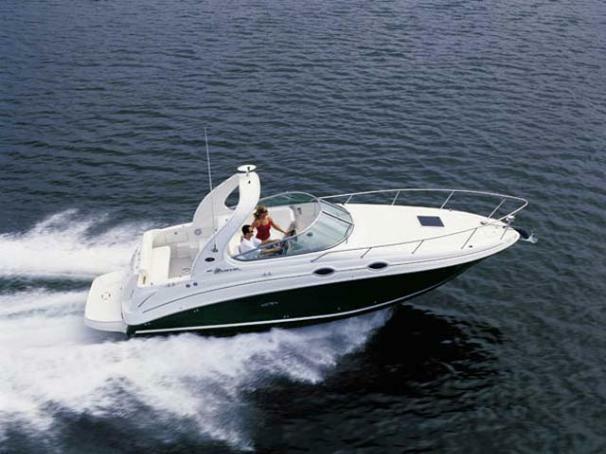 Boat Description For a classic combination of beauty and power, just step aboard this dynamic Sea Ray 280 Sundancer. It`s powered by a 375 horsepower 496 Magnum Bravo III MCM stern drive and features a sporty, molded-fiberglass spoiler with overhead lighting, plus an extended swim platform with concealed swim ladder. Additional amenities include AM/FM/CD stereo and Sirius Satellite Receiver, removable carry-on cooler, optional flatscreen TV/DVD player, and hot and cold transom shower. Engine Notes Volvo diesel stern drive also available. Twin Mercruiser stern drives also available.